As I had mentioned, I stayed at the Paradise Pier Hotel. I really couldn’t imagine what a great choice this would have been. Of the three official Disney Properties, it’s the “cheapest,” and the farthest – if you can count a 10 minute walk to the front of the Magic Kingdom as far. I also made the point on a different post that I was staying in a Standard View room on the third floor. While this did not allow me to see into California Adventure much (I could see the top of the Ferris Wheel and Tower of Terror in the distance. Though, I could also see some backstage areas – including a float after a parade. Anyhow, on the morning of the 10K, I looked out my window and to my surprise I could see the corrals and balloons. Not only that, but I could see the Corral C balloon; and being in Corral C; I would enter right where that balloon was. The balloon indicates the “entry” to a Corral. Fairly awesome. At the point I looked (right when I woke up at 5am), not many people were lining up. The race officially was set to start at 6am. So, I decided that I would be able to get up at 5 and be alright. I had went to bed early the night before, again. Waking up early had helped with my getting a full sleep. 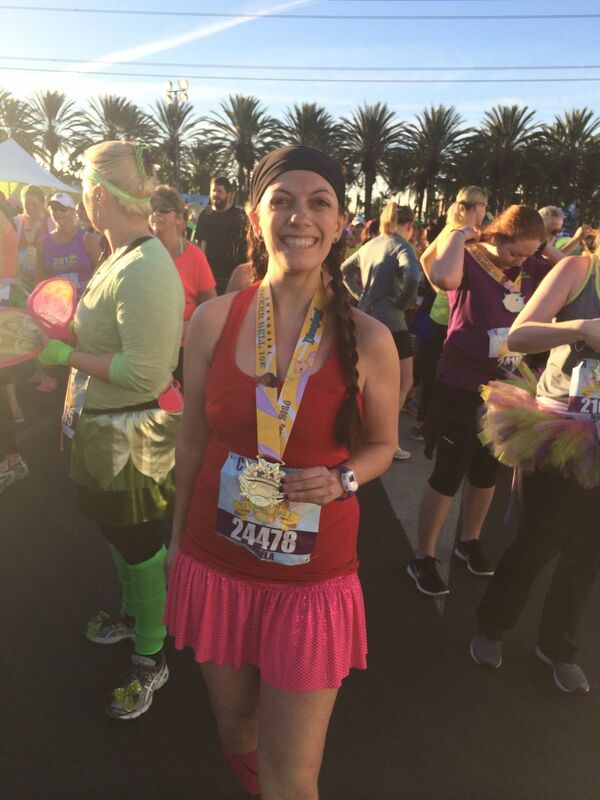 I had my run gear – outfit, Garmin, FlipBelt, headphones, bib, etc. – set out on the bed and ready to go. So, when I woke up, I was ready in 15 minutes. Because I was able to sit by the window and watch, I didn’t head down to the corrals until 5:30, when it looked like more people were gathering. My outfit wasn’t as much fun as it had been the previous day. I didn’t know how I’d handle running double the mileage with anything cumbersome – i.e. fairy wings. I went with a pink theme; a Sparkle Athletic Skirt, Shorts underneath, Pink CEP sleeves and a Red Lululemon Racerback (another obsession). This outfit didn’t bother me at all during the race. Very breathable. Being steps from the race front; it probably only took me 5 minutes to walk down to the street. And most of that time was spent waiting for the elevator (there are no stairs at Paradise Pier; unfortunately). There were four corrals for the 10K: A through D. I was in C. I’m not sure how that happened. I had submitted a “guess” of my pace (12 minute mile), but had nothing to back it up. So, I was pleasantly surprised when I received a “C” on my bib at package pickup. Early morning at the front of Corral C; you can see the entry point to "B" with the balloon in the picture. This brings me to a point (and sometimes drama ensues) of Corrals. Racers care about them for many reasons. While you are required to maintain a 16 minute pace; if you start in a beginning corral, you may not get swept as quickly, even if maintaining a 18 minute pace, because the Sweepers do not cross the finish line until the last person passes. Basically pushing 15,000 runners across the start line takes time; and if you’re at the start of the pack, that’s more time for you. Of course, your time doesn’t officially start until you cross the line. I prefer to be in a corral in the middle of the pack – because I know at least at the beginning I can maintain a middle-ground pace (12 minutes); and I will avoid gaggles of walkers, knotted arm in arm, side by side. Nothing against walking – as you’ll see later on in this post; I walk. It’s the etiquette of moving to the side, not walking more than two abreast that seems to slip by the wayside. Corrals are set up with fastest runners in the front – elite runners who can pull off a quick mile and keep that pace for 6 or more miles. I’m talking less than a 7 minute mile here. Then, the last corral is for those who are going to be straddling the 16 minute mile pace and walkers. The setup is to keep congestion clear and as a safety measure – someone running twice as fast as another runner should be with like paced runners. Now, as I mentioned, everyone wants to be at the front for the extra time – more time to run, more time for stops, etc. BUT, honestly, everyone should keep to the respective paced corrals. As you get farther back, it’s harder to run around people – because there are lot more; and people are walking. So, don’t be surprised if you’re given the stink eye if you’re in Corral A and do not have “Olympic Runner” tattooed on your forehead. In the half hour I had in my corral, I started to make my way towards the front. I was expecting people to be packed like sardines, but they were fairly spread out and a lot of people were sitting on the side. I had mentally prepared myself for the race beforehand by viewing the map. I knew that we wouldn’t be in the park until after mile 1. So, plan was to run when I could and try to get a good space between myself and the others in my corral. As 6am approached, people started packing in more tightly; but still not overwhelming. 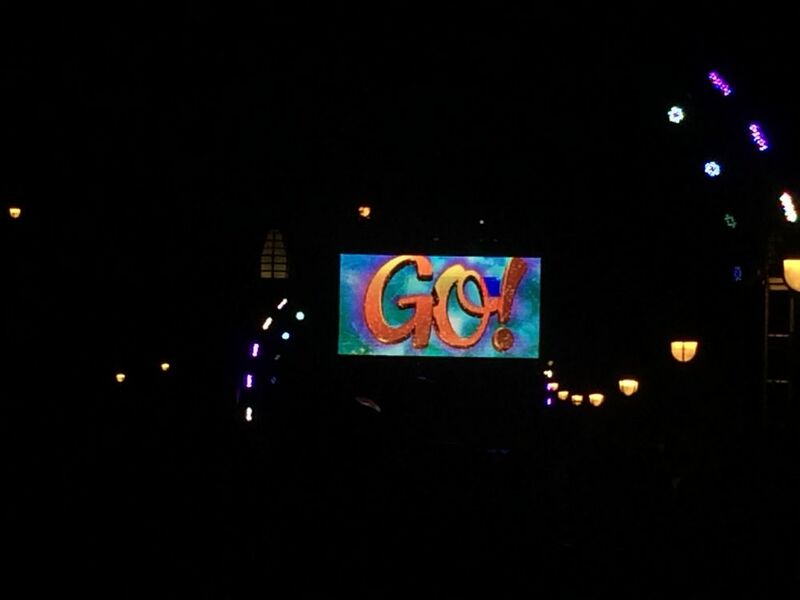 Each Corral started off by Tinker Bell coming up on a projection screen and a big "Go!” telling you to start, though you didn’t really need that – the people around you would let you know. It was 6:02 before the first Go! was announced and the A-Team was off; leaving everyone in a trail of dust. We were shuffled by each Corral to the start line. I crossed at 6:12. 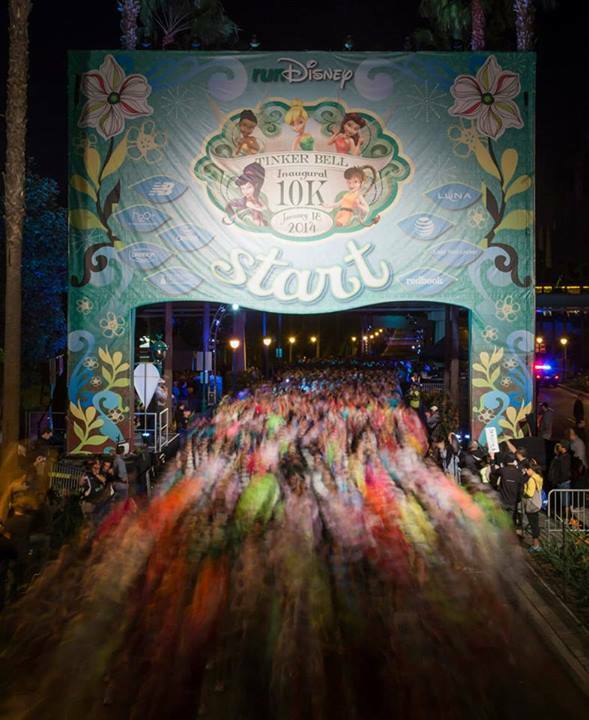 As mentioned, the first mile of the race is heading north, and around to the top right corner of Disneyland Park, entering backstage through a Cast Member area. I did as I planned and ran. I did have to do a good deal of swerving, despite being on an 2-lane ramp (there is a ramp, so a “hill” first off). But, by the time we entered the parks, I felt a comfortable pace ahead of my corral and didn’t have as many people around me. Though, I will note that as we passed mile 1; my Garmin said 1.1 miles. I had pressed the start button AFTER I stepped over the start line. Hmmm..
We entered Disneyland Park near Splash Mountain and moved on past the Haunted Mansion. This is where I saw the first characters. Though, I had decided ahead of time not to stop until I saw Fairies. It was a good sized line for the two characters, as apparently a lot of people do not see them out. I had previously a few time at Walt Disney World during Halloween, so they weren’t as “rare” for me. Once I passed the Alligator escaping, tight-rope walking ballerina and the I’ll-Marry-Anyone-as-long-as-I-have-a-husband bride, I started down into the square past Pirates. I was all prepared to continue running and gasp! I saw Chip and Dale. Le Sigh. They’re my favorites. I had to go back for them. So, I turned around slightly to get to the back of the line. I waited about 4 minutes per my Garmin; and then continued on. I would have estimated the line for the Haunted Mansion characters as double that; so 8 minutes, just based on length. I will say they were rather quickly though; and it’s nice having a Cast Member there to take your camera/phone for a picture in addition to the official MarathonFoto photographer. Continuing on, we went past Big Thunder Railroad, behind the Castle, through Fantasyland (where I believe I saw Mary Poppins and Bert, but I didn’t stop) and onto Tomorrowland. In Tomorrowland Buzz was out and a Lightyear-costumed cheerleader was out urging us on. We moved back in front of the Castle and onward down Main Street; and before we knew it, we were out of the first park. In-between parks there were white barriers that kept us grouped so guests and family could cheer you on from outside them. I’d estimate they were about 6 people in width. And, we were onto California Adventure! 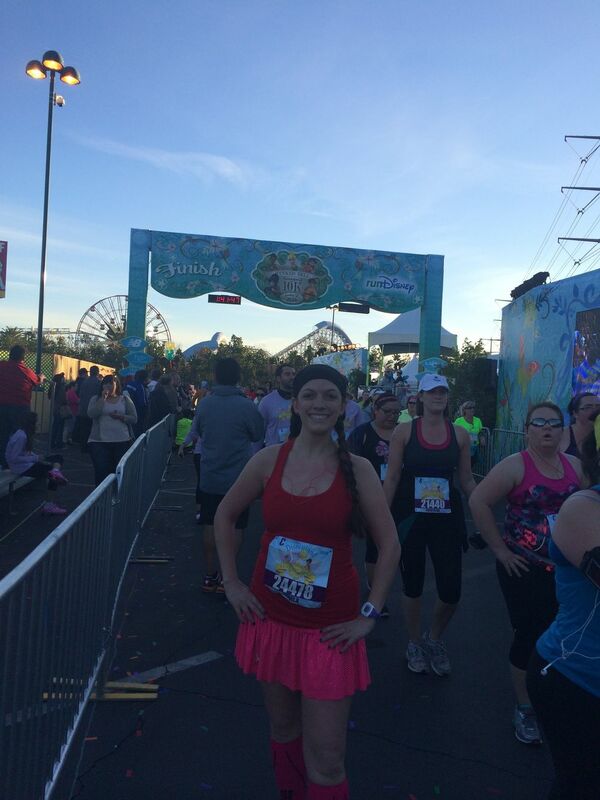 We ran past Grizzly River Run, and then made a right at the Little Mermaid Ride. So, we were going the opposite direction on the Pier than I had during the 5K. The World of Color lights were opulent once again, so that made for a lovely visual while running around the Pier. We were then guided to Cars Land, where Mater and Lightning McQueen were again greeting everyone (but I didn’t stop); and back towards Tower of Terror. At this point, we were just before Mile 4 and about to exit the park. Mike and Sully donned in Monsters University gear and with University Cheerleaders were waiting for pictures near a float (that I imagine they use during the daytime parade). I could have stopped. I wanted to, but then I also wanted to run. I should have, but passed it up and moved onto the 2 miles within Anaheim. Now, this point, just before the 4-mile mark, is where I read that a gate was closed and anyone under pace was cut. I’ve also read that some people were at pace, but were cut anyhow & bussed back to the finish; or handed their medals in a different area. I wasn’t present, so I don’t know how everything went down; or if people were actually at pace, above or below. There were plenty of character stops; and if you had stopped for the Haunted Mansion (which if it was 8 minutes for me; would likely have been upwards of 10 for others), then you’re really pulling time from the 16 minutes you’re given (just a calculation, but if you had just below 64 minutes to get to that point, and you waited for every character, you may be at 44 minutes to run 4 miles – or an 11 minute mile, which might not be possible for some people in the 16-minute group). I wouldn’t be surprised if a good deal of people were below and just didn’t realize, though do speculate that some people were above and other circumstances cut them off. This was the first 10K after all, so maybe something wasn’t planned correctly. Once I was outside the park, with 2 miles left, I made a decision. I was going to walk. I knew I was about 8 minutes above pace. And I had the half the next morning, so not pushing it would be good for me. And walk, I did. I kept still about a 15 minute pace; but the majority of the miles on the street were walked. As we rounded the corner to the finish, I put on a light run (about 13 minute pace for me) and crossed the line! Mickey and Donald were there to high-five, just BEFORE the finish line; but you couldn’t take pictures with them (i.e. stop and smile). You had to be lucky enough for a MarthonFoto photographer to grab a picture of you at just the right moment, without people in the way, if you wanted a picture of you fist-bumping or what have you. The only photographer I saw at the finish line was sitting on the ground on the left side; and I was on the right side; so my Finish Line pictures aren’t that great. That was unfortunate. I crossed in 1:28; or a 14:20 pace. Though, my Garmin said I had ran 6.35 miles, and not 6.2. I'll note this more in the half review, too. I felt good, not sore and not rushed. I was happy with that time and felt so much better going into the half the next day. The race was overall, very good, but of course I nitpicked (as you probably caught on to) a few things. I grabbed my medal from a lovely volunteer (than you volunteers!) and headed down the after-course to pick up my goodies box, a banana, and a bottle of water. I also picked up a mylar RunDisney wrap. I was going to use this in the morning to keep warm as I was kind of chilly this morning (more on weather in my half post). And back to my hotel. Despite not being sore, I was still happy to be able to walk practically right into the hotel, go back up to my room, and relax in about five minutes. Speaking of MarathonFoto - I'll post more about them on my half review. I didn't have many pictures at all during my 10K - "official pictures that is." The course was alright. About 3-3 1/2 miles in the parks/behind the scenes. Not too bad. So, about half the race. I knew this ahead of time, though, and was able to plan accordingly. I kind of wish the course had been backwards. I could have ran the first 2 miles without worrying about stopping for characters, kept a fast (for me, 12 minutes is fast) pace, and then walked more in the parks to enjoy them. But, something about running the parks is great, anyhow. Even if everything is passing you by. There were a few places the course narrowed. The barriers between Parks, as I mentioned briefly; and more notably I remember a small archway/tunnel before entering Splash Mountain area, just before seeing the Haunted Mansion characters. I think you could only fit 4 people side-by-side. At this point, about a mile and half in, my corral was rather spread out. I didn't know how it would be for the last two corrals, though, dealing with more congestion. Again, this is fine, side-by-side as 4 people IF you can get past. Trying to keep your running pace and coming upon four friends walking side-by-side, you're forced to stop. So, that's the only complaint in regards to the narrowing. But, it has to happen to go through that area of the park (at least in the instance I remember). The only way to get things to change is to mention them. 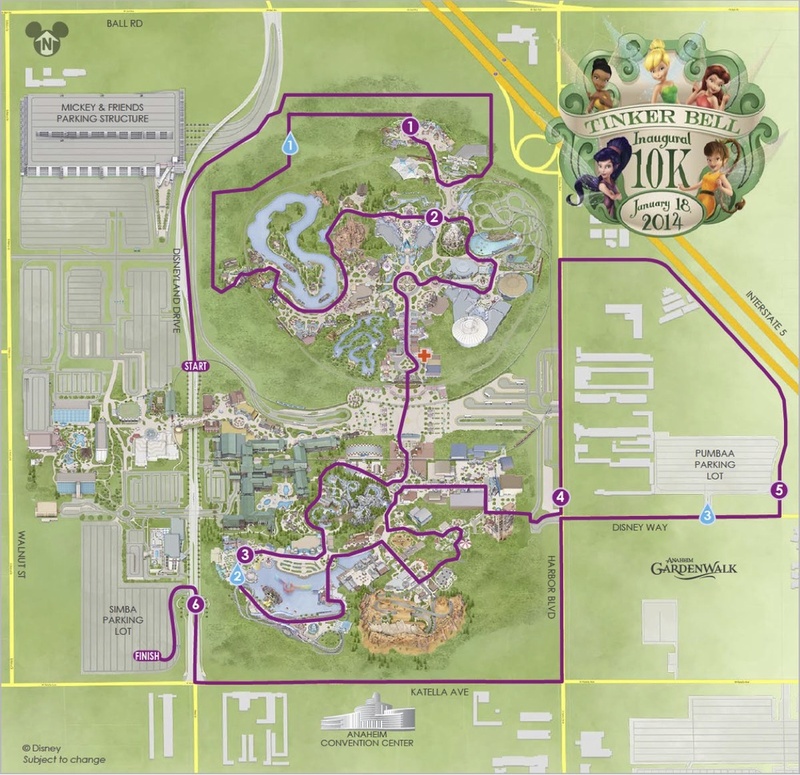 This didn't take away from any of my fun - by any means, it's just one of the "cons" of running a Disney Race - different paces mix in and can cause clusters of congestion. I thought the corrals were set up well for this Inaugural race. Each one seemed to be spaced fairly even (though, again, I'm reading that the last corral was split into two groups and the balloon lady started before everyone had crossed the start line - but I don't know what of that is truth because I wasn't there). The medal is beautiful. The details of the fairies are great. Being a Disney Nerd, I can tell who each one is. It's a good weight and one of the nicest I've seen (I only own one medal from a half marathon, but I have perused other friends' and it seems Disney has the best). I'm looking forward to all the others I'll receive this year after (man)handling (my precious!) all of them at the expo. 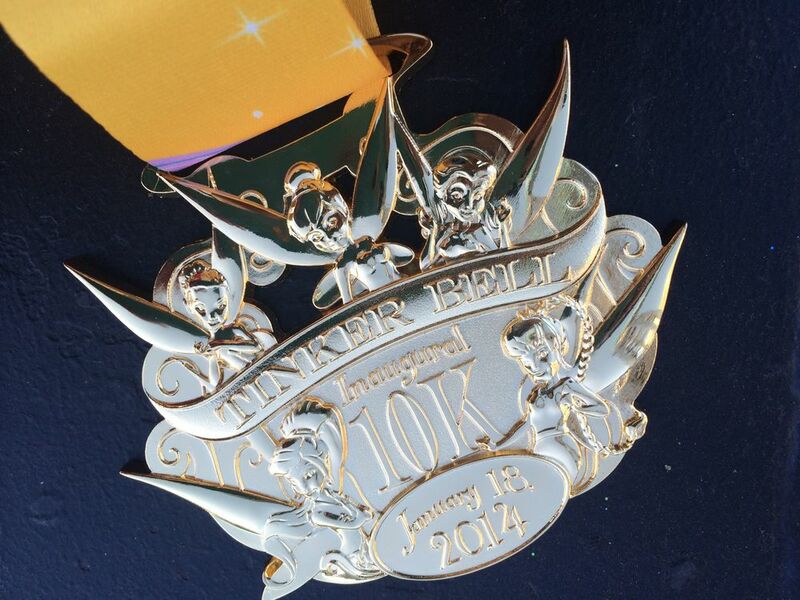 So, overall, a great first RunDisney 10K. 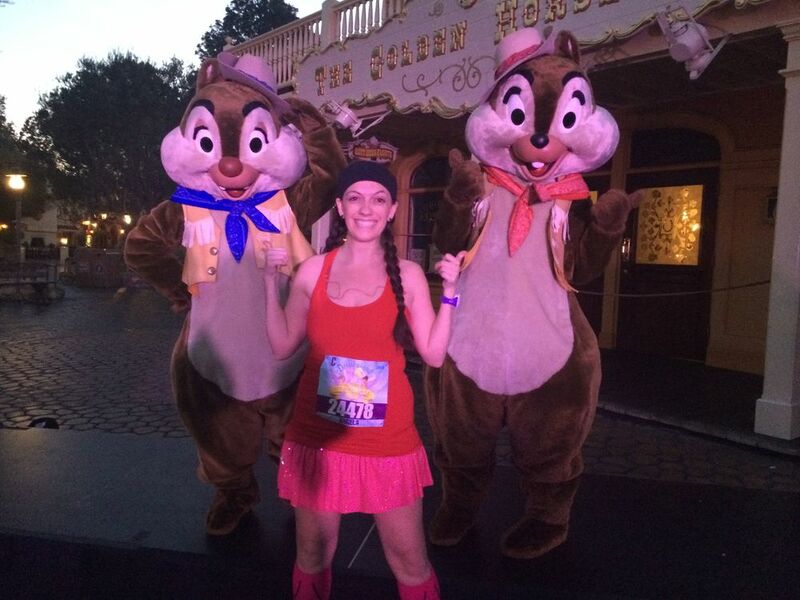 I had a great time, did get to see Chip and Dale, and made a better pace than I was expecting. The time does creep up on you, though. I did go out in the parks for part of the evening, and ate again at the Napa Rose bar (as relayed in my Napa Rose review).